This article is for the 4★ , Tamamo-no-Mae. 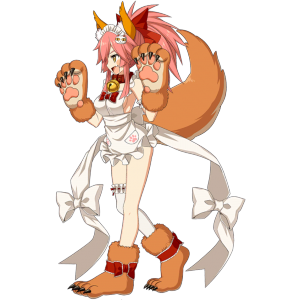 For 5★ , see Tamamo-no-Mae or for 5★ , see Tamamo-no-Mae (Lancer). Low chance to reduce an enemy's NP Gauge by 1. +2000 Max HP of all allies while she's on the field. 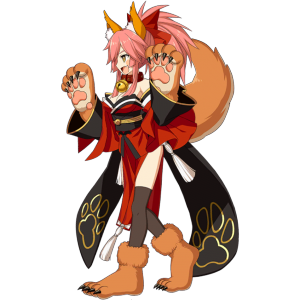 After Tamamo-no-Mae raised her divinity through thousand-year training, she returned to a one-tailed fox and the other eight were cut off. Each tail gained divinity of their own and became individual souls, that could be summoned as Heroic Spirits. 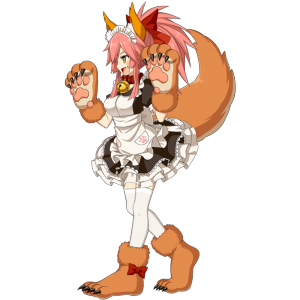 A crystallization of the (rather) pure side of Tamamo-no-Mae. 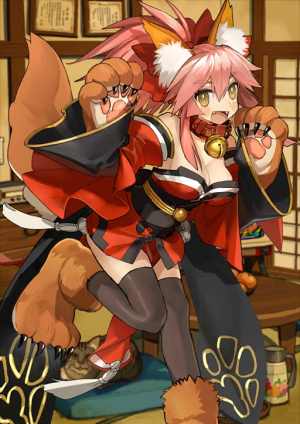 Due to her muscles, Tamamo Cat is slightly heavier than Tamamo-no-Mae. You don't know what she's going to do, or what she wants to do. She's like a wild cat. Since she's a Berserker, it is difficult to communicate with her. 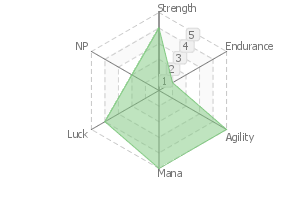 She's only interested in tasty and fun things, and enjoys being a carefree hunter. A variant of the "Eightfold Blessing of Amaterasu". Originally this Noble Phantasm was modeled after a torture game where humans were sent into a forest with a tiger, not for the humans to hunt the tiger, but the tiger to hunt the humans. It seems like the meaning of "feasting" has been changed here. She creates a temporary body. It is the same spell used by the Millenial Fox of China (whom many believe is the same person as Tamamo) to possess Daji in the "Investiture of the Gods." Due to past trauma, Tamamo-no-Mae has restricted herself from using this spell. 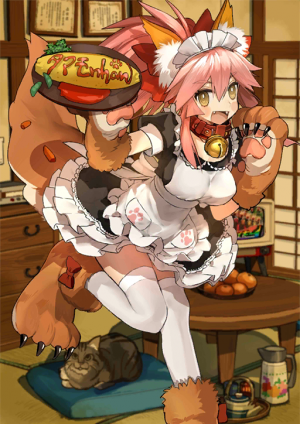 But Tamamo Cat does not have self-control. She only knows chaos. Ranks up all her parameters, but takes away a majority of her sanity. 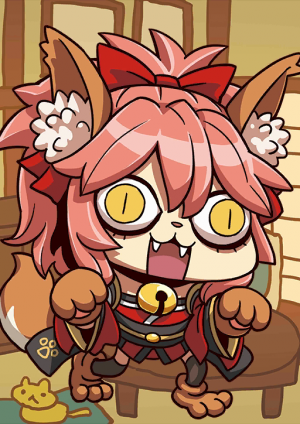 Tamamo Cat has little sanity to begin with so it's hard to call this a Madness Enhancement. Sometimes she surprises people around her by muttering words that are meaningful. This page was last modified on 2 January 2019, at 20:03.